Heat exchanger fouling is a major issue for heat transfer efficiency durability. In this study, we want to identify the evolution under fouling conditions of the performance of several geometries of finned tubes exchanger. We are particularly interested in whether it is preferable to choose an inefficient but easily cleanable heat exchanger over a more complex geometries that do not require cleaning. The article focusses on finned tubes heat exchangers that are dedicated to flue gas heat recovery from a chimney. In order to study several different configurations in controlled conditions, a test bench has been designed and manufactured. 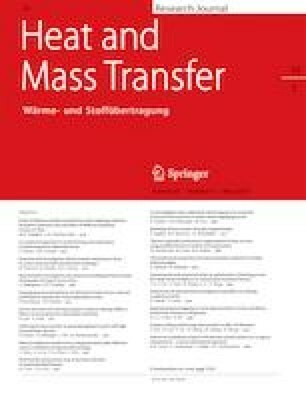 Heat transfer coefficients and the pressure drop of the different exchangers are calculated for an air flow of 190 °C and 6 m.s−1 with controlled dust injection. No pressure drop changes were observed during fouling tests for any of the heat exchanger configurations. This is probably due to the small thickness of the fouling layer and the modification of the external shape of the tubes by dust deposition that affects favorably the aerodynamic profile of the tubes. As expected, there is a typical exponential decrease in the heat transfer coefficients versus fouling time. When comparing the relative heat transfer decays during the fouling experiments for different heat exchanger configurations, it has be found that increasing the fins surface always improves the performance of the heat exchanger even when it is fouled. The authors would like to thank the Icam students, Olexandr BAL, Baptiste GENAUZEAU, William LE GOFF, Mathilde CLEMENT, Simon PASQUIER, Luc BLEUZEN, Léo BEDERE, Laurent DESFLANS, Quentin SAVINA, Samuel GOBIN, and Alexandra ANSELIN for their precious participations to the study. This work was partially funded by ADEME and TOTAL in the frame of RTD program “Efficacité énergétique dans l’industrie”.